Bethlehem Steel. A city within a city. Smoking, exploding, grinding, alive with the shouts of men, it spread over ten miles and pumped out steel the way the springs in South Mountain pumped out water. Seen from above, it was a tangle of metal. Metal stacks billowing smoke, attached to towers in which molten steel simmered, surrounded by buildings and machinery crammed together like tightly fitting puzzle pieces. Iron rails sprinted alongside it, parallel to the Lehigh River down which boats still bobbed, and strong-backed men hauled coal from the trains into the bowels of the stacks. Bethlehem Steel was a blur of movement every single hour of the day. It was extremely lucrative for the men who sat in its offices. During the Spanish-American War, it raked in profits making warships. It made the metal for the hydroelectric plant that would siphon electricity from Niagara Falls. It made the long, thick axle for the 246-foot-high Ferris wheel that spun at the Chicago World’s Fair. It made the steel bones of the Chrysler building, Rockafeller Center, Madison Square Garden, the Supreme Court Building, the Golden Gate and George Washington Bridges, Alcatraz Island, the Empire State Building, the Bonneville and Grand Coulee and Hoover Dams. And more. Of course at the core was a hidden layer of people being paid next to nothing. First the Irish, then Austrians, Hungarians, Slovaks, Slovenes, Ruthenians, Poles, Ukrainians, Italians, Greeks, and Romanians flocked to Bethlehem to work at the Steel. Bethlehem’s shape changed forever. The quiet, self-sufficient toiling of the Moravian pilgrims gave way to a loud, vibrant city. Streets devoted to Hungarians, next to them a string of Slovak families in rowhomes, a whole neighborhood with Italian drifting from the windows. All clustered around the Steel, in houses made of brick. The men worked twelve hours a day at twelve-and-a-half cents an hour and came back with soot in their ears. 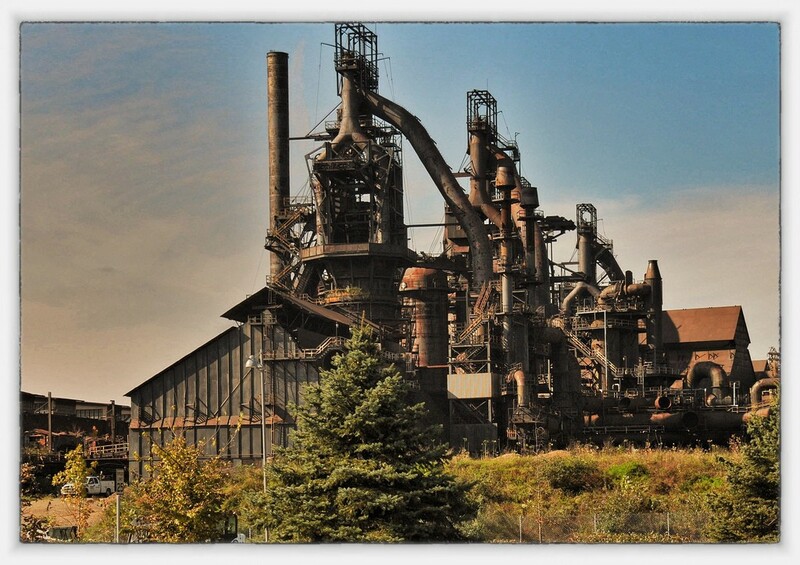 Andrej Okienka was born in 1934 and worked at Bethlehem Steel. At six years old he had a brother for every year of his life. One by one, each went to work in the Steel. Two in the blast furnaces, with their father; two with the bricklayers; one in the riggers gang. Andrej, a bone-thin, large-eyed child with shiny black hair, watched them with deep longing. Eager to be a part of Bethlehem Steel, the Bethlehem Steel, where every man he knew turned his brawn into metal. They lived in the South Side of Bethlehem, like many steel families, on a street of mostly Slovaks with some Hungarians. A street dense with brick houses rising with the slope of the land, the houses spare but well kept. Stoops scrubbed clean on Mondays. There were gardens in the small backyards, with vegetables sprouting in straight lines in the spring and summer. The occasional car parked along the street, but most families didn’t own one. People walked to work or took the trolley. A film of dirt covered everything like gauze. This was not to be helped. The stacks, casting their shadow over the neighborhood, dumped thick black smoke into the air at all hours. Not to mention the constant explosions — bang! — of the blast furnaces. Rattling the windows every fifteen minutes. Sometimes it kept Andrej up at night. You’ll be sorry if you don’t hear that banging, his father told him, late one night, when the man came home from work oily and black. If you don’t hear that banging, you’ll be crying. Andrej understood early on the Steel put food on the table. Everyone’s table. He helped his mother. In the mornings he took the ashes out of the coal stove and dumped them out back, then helped her scrub the floor of the black trail he’d left. After school he and his brothers helped her make the starch for the linens. Washrags, dishrags, tea towels, Sunday suits. It took her three days to iron it all. In summer, the sweet smell of jelly wafted off the stove. They all helped put in glass bottles, 150 of them to be piled high in the basement. Down there they kept a huge tub of sauerkraut, as big as Andrej, and an even bigger barrel of potatoes. If company showed up unexpectedly, which happened weekly, their mother fried some of these up with eggs. Twenty people packed the kitchen table, talking with their mouths full. Explosions of laughter as the men did imitations of the foreman. Long camping trips in the summer, with his brothers, before war whisked three of them away. They saved pennies all year to hop the Lehigh New England Rail to Saylors Lake, 25 miles north, where they slept on blankets in the woods, in makeshift tents made from slinging tarps over the branches. Spent their days catching trout, their evenings catching frogs, frying both in the same pan. One year when Andrej was six a group of Dutch boys joined them in the woods, by chance. They were sons of Steel management. They had a real tent. One hot afternoon, when his brothers were practicing their dives off the bank, Andrej wandered over to get a better look. “What have we got here?” said one of them. Four blond boys with straight backs sat in the flapped-open tent. A pile of red meat on brown paper: steaks. One boy tossed a slab into an iron skillet and held it over the fire. An unearthly scent filled the air. A burst of laughter as Andrej stood there with his eyes closed, saliva filling his mouth. The boys started speaking in Dutch. Andrej opened his eyes and watched their mouths move, the language, like a clucking, unfamiliar to him. He could speak Slovak like breathing, could speak English because he’d learned it in school, and could understand Italian and Polish because he’d caught bursts of both his whole life. But this language, spoken mostly in the rich Fountain Hill neighborhood, made him tilt his head. “Give him one!” said one of the boys, still laughing at this dirt-faced kid smelling steak for the first time. A steak landed in the grass. Andrej looked at it, then at the boys. A riot of laughter. Andrej grabbed the steak and ran off. A novella I’ve been working on for years. This is the beginning. I’m at this weird point where I think I need to share things from it to gather the steam to keep going. In many ways I don’t feel at all qualified to write this story, other than growing up near Bethlehem Steel and being intensely fascinated with its history, particularly the social dynamics of the city that surrounded it.